National Tribal Child Support Association Tribal Child Support Enforcement… Why Bother? 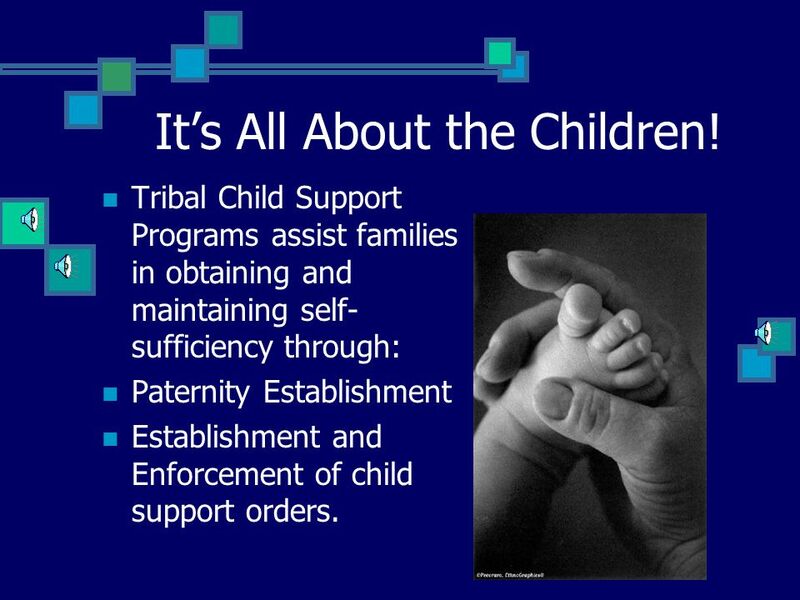 2 National Tribal Child Support Association Tribal Child Support Enforcement… Why Bother? 3 It’s All About the Children! 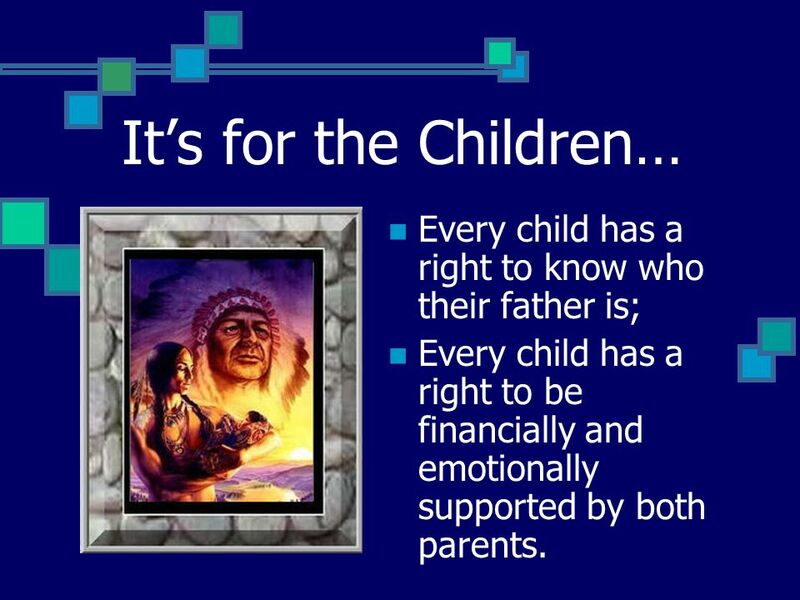 Tribal Child Support Programs assist families in obtaining and maintaining self- sufficiency through: Paternity Establishment Establishment and Enforcement of child support orders. 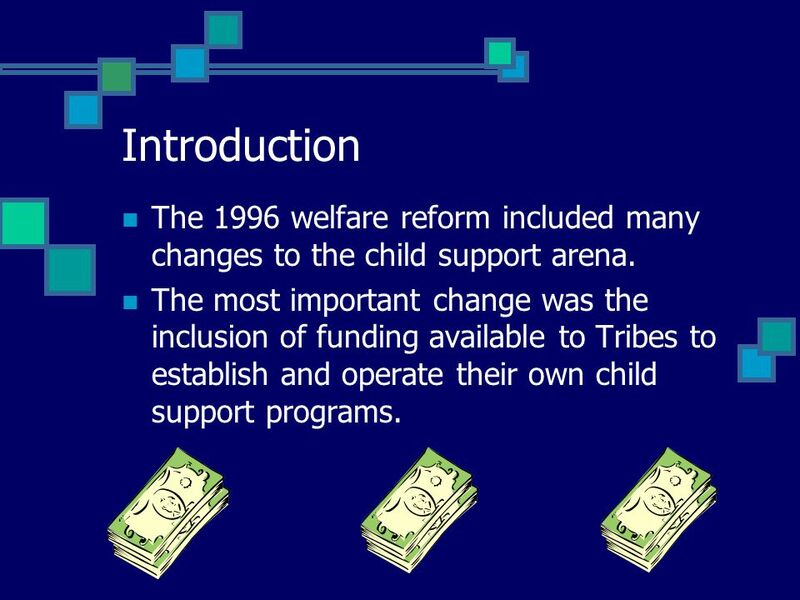 4 Introduction The 1996 welfare reform included many changes to the child support arena. 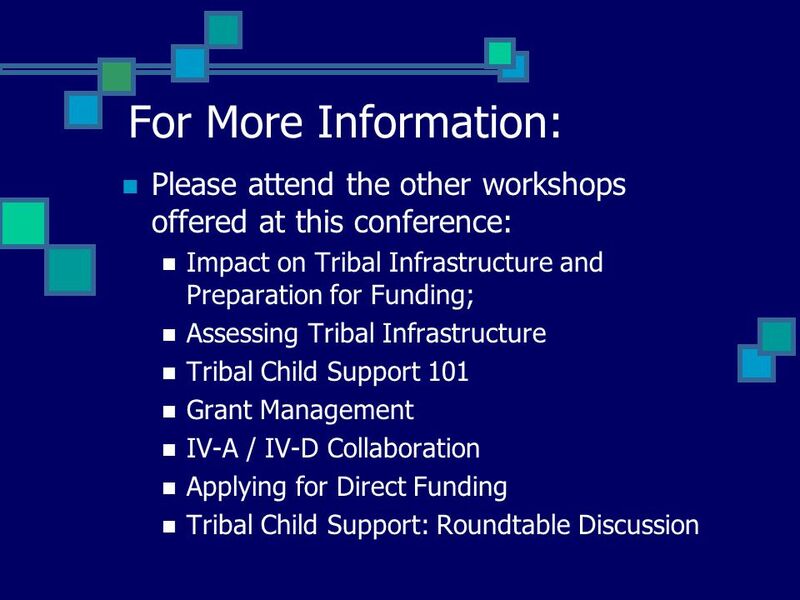 The most important change was the inclusion of funding available to Tribes to establish and operate their own child support programs. 5 Why Would You Want Your Own Program? 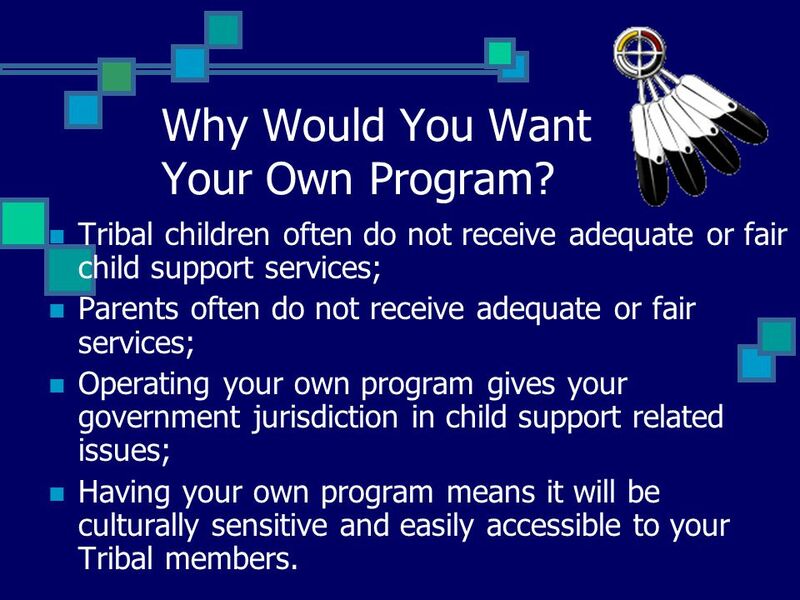 Tribal children often do not receive adequate or fair child support services; Parents often do not receive adequate or fair services; Operating your own program gives your government jurisdiction in child support related issues; Having your own program means it will be culturally sensitive and easily accessible to your Tribal members. 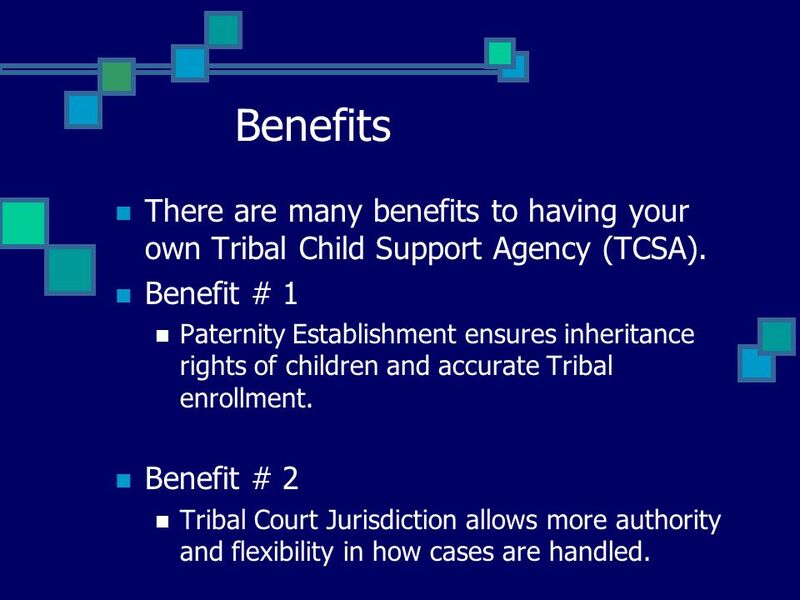 6 Benefits There are many benefits to having your own Tribal Child Support Agency (TCSA). Benefit # 1 Paternity Establishment ensures inheritance rights of children and accurate Tribal enrollment. Benefit # 2 Tribal Court Jurisdiction allows more authority and flexibility in how cases are handled. 7 Benefits (cont.) 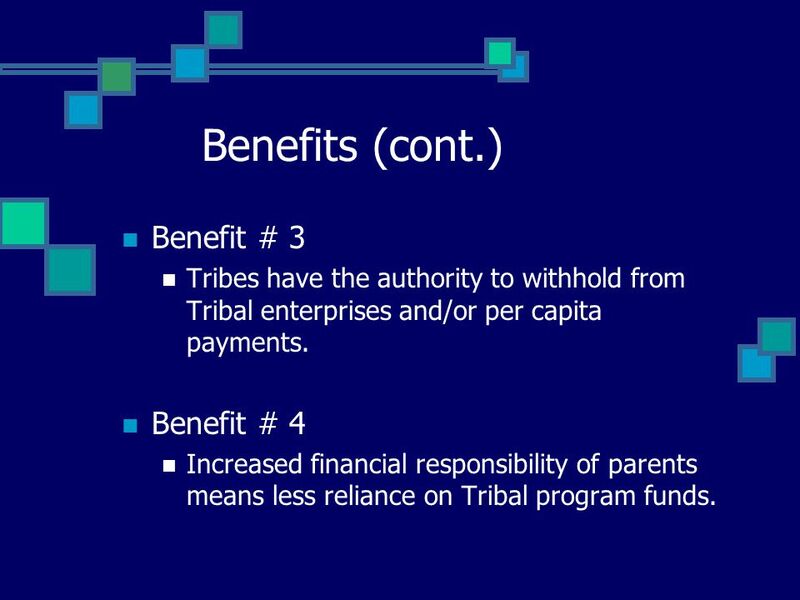 Benefit # 3 Tribes have the authority to withhold from Tribal enterprises and/or per capita payments. Benefit # 4 Increased financial responsibility of parents means less reliance on Tribal program funds. 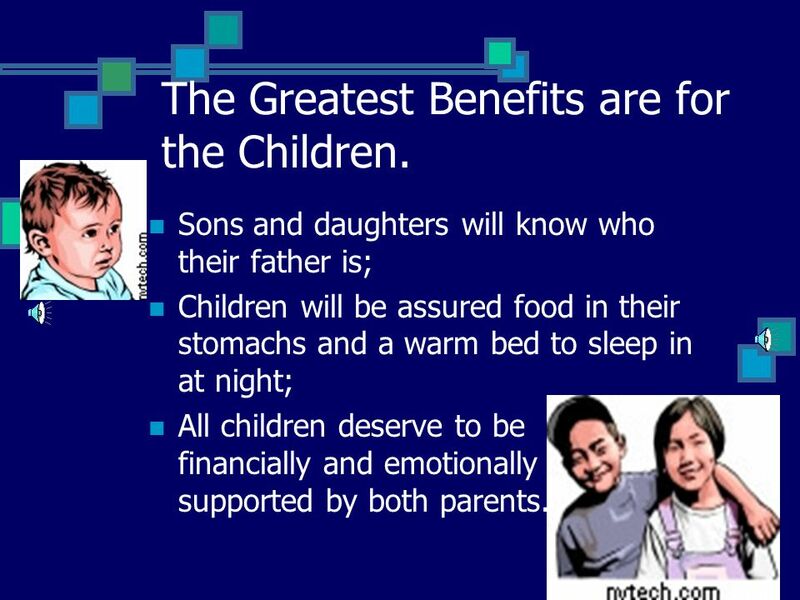 8 The Greatest Benefits are for the Children. Sons and daughters will know who their father is; Children will be assured food in their stomachs and a warm bed to sleep in at night; All children deserve to be financially and emotionally supported by both parents. 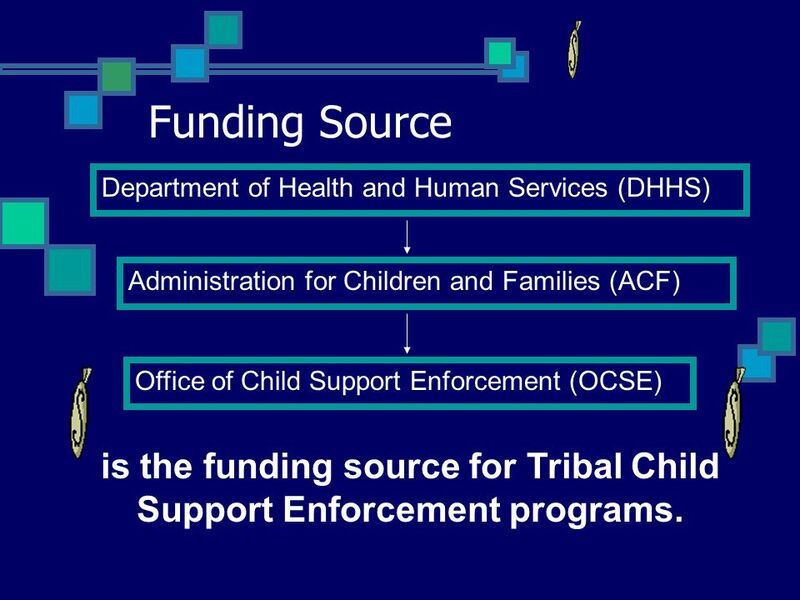 9 Funding Source Department of Health and Human Services (DHHS) Administration for Children and Families (ACF) Office of Child Support Enforcement (OCSE) is the funding source for Tribal Child Support Enforcement programs. 10 How Does my Tribe Qualify for Funding? 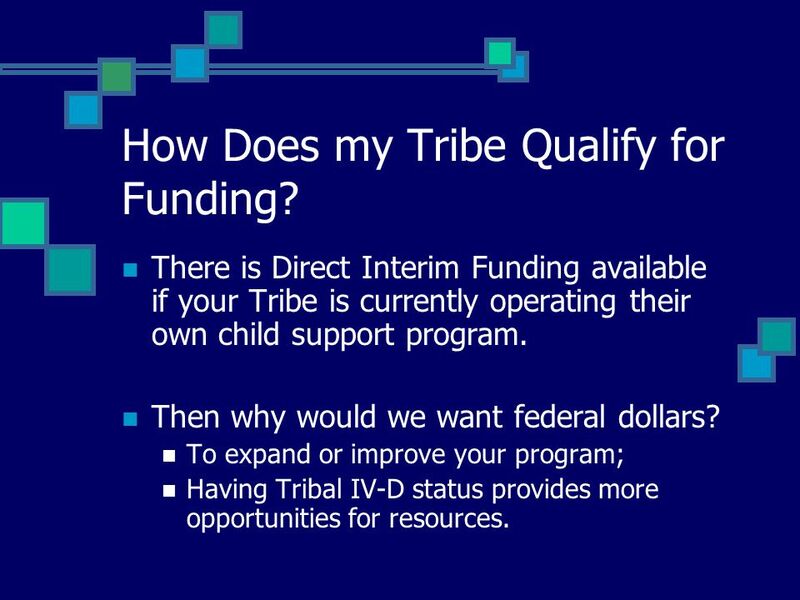 There is Direct Interim Funding available if your Tribe is currently operating their own child support program. Then why would we want federal dollars? To expand or improve your program; Having Tribal IV-D status provides more opportunities for resources. 11 Direct Federal Funds By late 2003 or early 2004, the Final Regulations will be published. 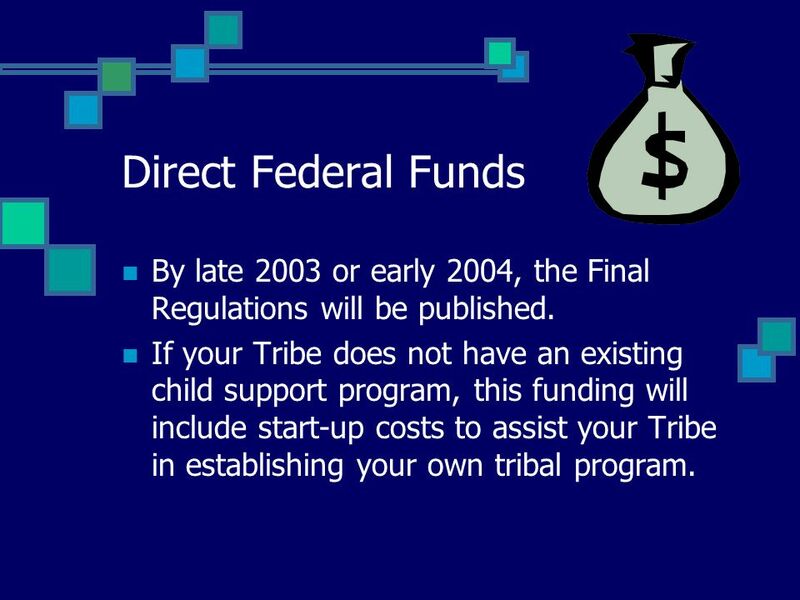 If your Tribe does not have an existing child support program, this funding will include start-up costs to assist your Tribe in establishing your own tribal program. 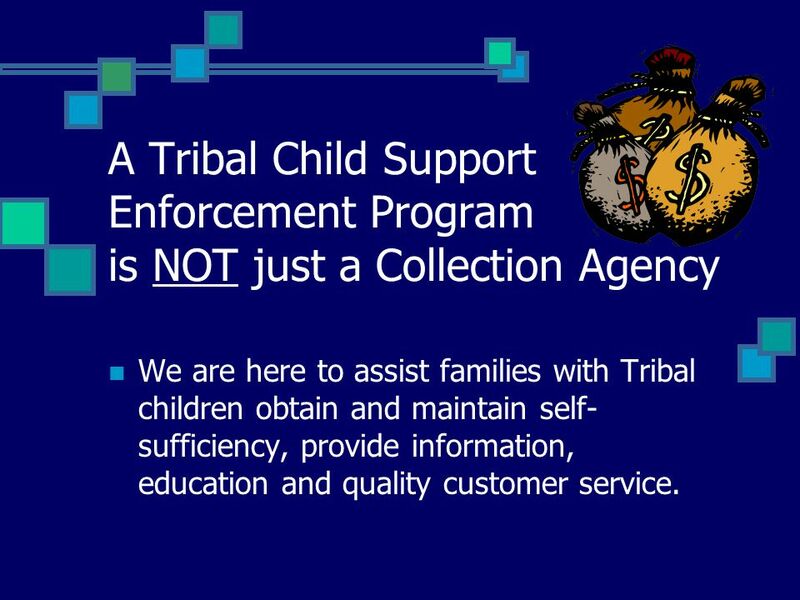 13 A Tribal Child Support Enforcement Program is NOT just a Collection Agency We are here to assist families with Tribal children obtain and maintain self- sufficiency, provide information, education and quality customer service. 14 It’s for the Children… Every child has a right to know who their father is; Every child has a right to be financially and emotionally supported by both parents. 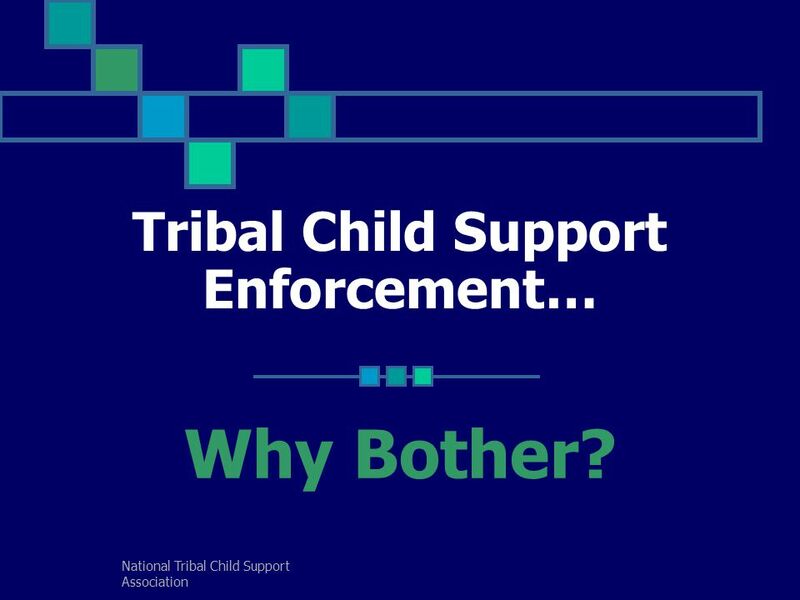 Download ppt "National Tribal Child Support Association Tribal Child Support Enforcement… Why Bother?" National Summit on Emergency Management and Assistive Technology Reutilization February 23-24, 2010 David Lett RESPONSE. RIte Share Premium Assistance Program Then and Now Kate Brewster, Manager Employer Contact Unit Center for Child and Family Health RI Department of Human. Association on American Indian Affairs The Federal Trust Relationship, Tribal Sovereignty, and Self-Determination Prepared by Jack F. Trope, Executive. Agenda My Background Homeless and Highly Mobile Children and Families McKinney-Vento Homeless Assistance Act Our Research What we all can do Website. 1 North Dakota Children and Family Services Review Paul Ronningen, Division Director Don Snyder, Permanency Unit Manager. ERICSA 51 st Annual Training Conference & Exposition ▪ May 18 – 22 ▪ Sheraton Greensboro ▪ Greensboro, North Carolina Tribal 101: Tribal Child Support.  Provide overview of the block grant statute requiring planning councils  Provide overview of statutory responsibilities of planning councils  Describe. 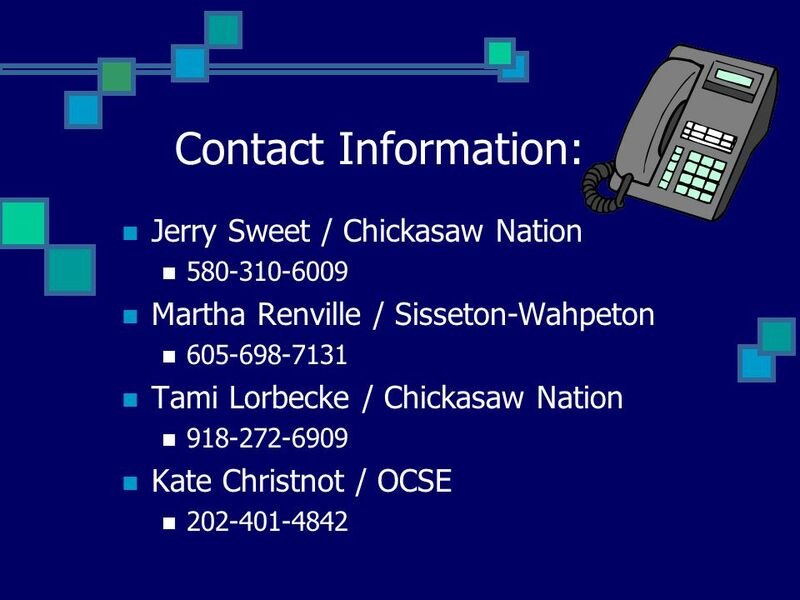 National Tribal Child Support Association Tribal Child Support Enforcement Everything You Wanted to Know… But Were Afraid to Ask. NEW DIRECTIONS IN CHILD SUPPORT: HOW CHILD SUPPORT AND ASSET BUILDING ARE CONNECTED Jennifer Burnszynski acf.hhs.gov. 1 Agency/Court Collaboration in the CFSR: ENGAGING COURTS AND THE LEGAL SYSTEM The National Child Welfare Resource Center For Organizational Improvement. 1 FTA Grant Process & Technical Assistance Federal Transit Administration November 2007. Welcome from Child Support Enforcement Program Our goal is to ensure that families receive the child support they need and deserve. QUALITY EARLY LEARNING. HOW TO USE THIS PRESENTATION DECK  This slide deck has been created by the U.S. Department of Education as a resource tool for. Mission: Protect the Vulnerable, Promote Strong and Economically Self- Sufficient Families, and Advance Personal and Family Recovery and Resiliency. Charlie. An introduction to for Caregivers. The Alliance for Child Welfare Excellence is Washington’s first comprehensive statewide training partnership dedicated. WHAT YOU NEED TO KNOW ABOUT TITLE I PARENT MEETING PRESENTATION.